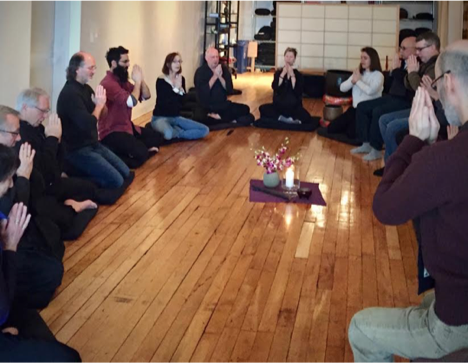 Our Sunday morning program begins at 9:30 am with three periods of Zazen, followed by the Practice and Inquiry Circle beginning at 11 am. You may arrive any time from 9:30 until 11 am. Wisdom and compassion are the two qualities espoused by Zen practice. Sitting in silence helps access the wisdom component—the underlying oneness of everything—while sharing our questions and struggles about practice helps develop compassion, or the ability to accept one’s own and another’s differences. Following a council format, the practice and inquiry circle fosters listening and speaking from the heart on a topic set by the leader. A container is thus created to speak one’s own truth and hear someone else’s. From this, a profound experience of acceptance and belonging is made possible, and with it, the realization of our interconnectedness. Once the circle begins, the door is closed, so please arrive by 11:00 am.